Welcome back to our continuing series of blog posts designed to educate and entertain our Internet users with the Team Santa Inc. News Daily. We want to say thank you to all the people who have become frequent users of both our blog and online stores. They say “things are out there in the blogosphere”. Well this little piece of the blogosphere belongs to Team Santa Inc. So now that’s straightened out, have you visited our selection of lighted Halloween decorations yet? 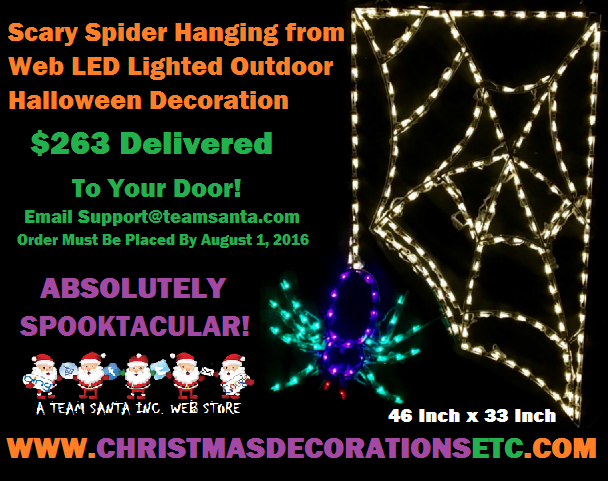 Today, we are going to look at the “Lighted Spooky Spider Crawling in a Web Halloween Decoration“. Colorful LEDS ignites the steel white frame with a colorful showing of light that’s both bright and colorful. This Halloween Decoration is also big with measurements of 46″ x 61”. You get a lot of lighted decoration in exchange for the money that you spend. The LED stringlighting is so meticulously clipped to the frame that there is absolutely zero assembly, aside from plugging it in. We are so sure that you will enjoy this product that we offer a money back guarantee. So as the customer, you are not exposed to no risk.